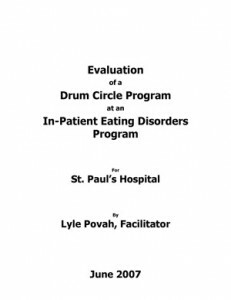 Drum Circle programs have run since 2006 on the In-Patient Eating Disorders ward at St. Paul’s Hospital. Drumming and Health gratefully acknowledges St. Paul’s Hospital staff for funding support. What did you think a Drum Circle would be like? Awkward, difficult, silly, hippy, hokey, boring, scary, complicated, anxiety-provoking, random beating on drums. How was the Drum Circle different than what you expected? Freeing, exciting, inspirational, completely engaging, really fun, fantabulous beyond all expectations, always gets me from blah to yaay!! “Best post meal group ever. Totally lifts our spirits.” Patient, March 13, 2014. “It connected me to my soul.” Patient, Readiness Program, May 22, 2013. What did you like best about the Drum Circle Program? * 2 North Psychiatry Ward – initial four week pilot series, followed by a 4 month Drum Circle Program (completed March 2012). For a summary of the latest research with eating disorder patients, click here. For the complete study, click here. 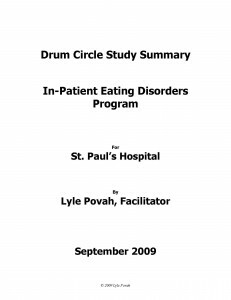 Lyle Povah has been leading a Drum Circle Program at St. Paul’s Hospital in the In-Patient Eating Disorders Program since 2006, offering an initial 4 week pilot series, then a 3 month program in 2007 (see program evaluation below), a 6 month program in 2009 (see study summary below), a 10 month program in 2011 (see description below), and commencing in October 2012, an 8 month expanded 2 session program until June 2013 (now extended to March 2014). Lyle has developed specific protocols for the Drum Circle Program which he continues to expand and refine. 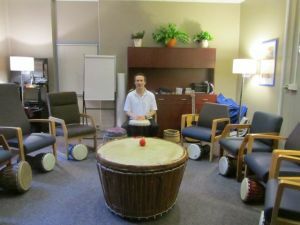 This Drum Circle Program ran weekly for a period of 10 months from June 2010 to March 2011 at St. Paul’s Hospital in Vancouver, Canada, in the In-Patient Eating Disorders Program. The research study was conducted using the validated PANAS (Positive and Negative Affect Scale) to determine how the Drum Circle experience affected patient emotions and feelings. The hypothesis “Drum Circle participation increases the positive and decreases the negative emotions and feelings in eating disorder patients”. Over the duration of the 40 one hour weekly Drum Circle Programs, 79 different patients participated in a total of 204 individual Drum Circle experiences. On a scale of 1 – 5, patients rated 10 positive emotions and feelings and 10 negative emotions and feelings before and after the experience. Their pre-scores were done immediately following a meal (a high risk time for eating disorders behaviors), just before commencement of the Drum Circle Program. Participants who took part in just one drum circle intervention experienced a highly statistically significant improvement in positive affect (emotions and feelings) after the intervention. Participants who took part in one or more drum circle interventions experienced a highly statistically significant improvement in positive affect (emotions and feelings) after the intervention. Participants who took part in one or more drum circle interventions experienced a highly statistically significant decrease in negative affect (emotions and feelings) after the intervention. Participants who took part in three or more drum circle interventions experienced a statistically significant improvement in positive affect compared to those who participated in less than three drum circle interventions. The CV below lists some of the programs Lyle has facilitated that specifically deal with people with eating disorders. There is strong support in the health community for the use of music, rhythm, and drumming to effect positive change.